Coral bleached for two consecutive years at Australia's Great Barrier Reef has "zero prospect" of recovery, scientists warned Monday, as they confirmed the site has again been hit by warming sea temperatures. 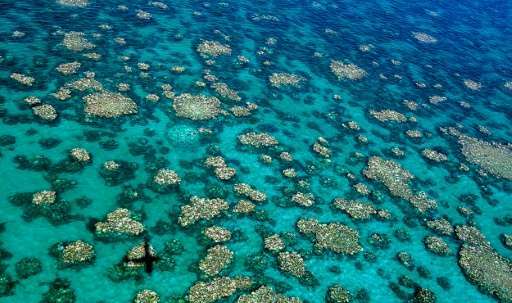 "Bleached corals are not necessarily dead corals, but in the severe central region we anticipate high levels of coral loss," said James Kerry, a marine biologist at James Cook University who led the aerial surveys. "It takes at least a decade for a full recovery of even the fastest growing corals, so mass bleaching events 12 months apart offer zero prospect of recovery for reefs that were damaged in 2016." 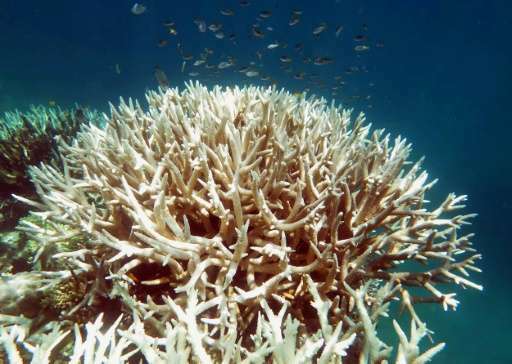 It is the fourth time coral bleaching—where stressed corals expel the algae that live in their tissue and provide them with food—has hit the reef after previous events in 1998 and 2002. 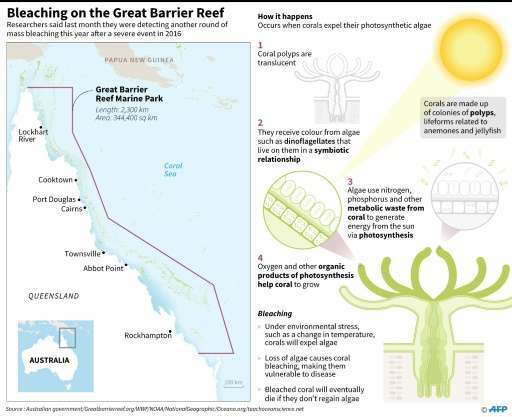 "The combined impact of this back-to-back bleaching stretches for 1,500 kilometres, leaving only the southern third unscathed," said Terry Hughes, head of the Centre of Excellence for Coral Reef Studies, also at James Cook University. "The bleaching is caused by record-breaking temperatures driven by global warming. "This year, 2017, we are seeing mass bleaching, even without the assistance of El Nino conditions," he added, referring to the natural climate cycle in the Pacific Ocean. The Barrier Reef is already under pressure from farming run-off, development and the crown-of-thorns starfish. The extent of the destruction wrought by Debbie is not yet known, although scientists have said damage could range from minor to severe. "The feedback that's coming back is the more sheltered areas have come out a bit better, but they all seem to have suffered some form of damage," Association of Marine Park Tourism Operators' Brendon Robinson told the Australian Broadcasting Corporation. The Whitsundays is one of the reef's tourist hotspots, attracting more than 40 percent of total visitors to the iconic marine ecosystem. "Clearly the reef is struggling with multiple impacts. Without a doubt the most pressing of these is global warming," he said. "As temperatures continue to rise the corals will experience more and more of these events. One degree Celsius of warming so far has already caused four events in the past 19 years. "Ultimately, we need to cut carbon emissions, and the window to do so is rapidly closing."